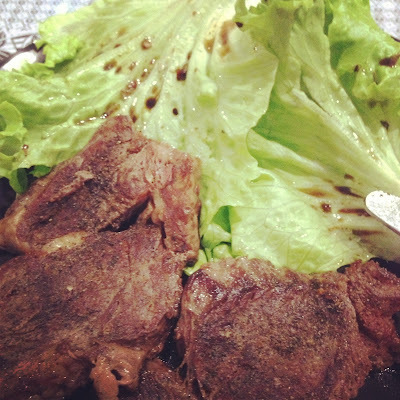 Tee's Blurbs: cooking 101: steak, steak, steak! 1. Before cooking, make sure that the steak had already been thawed and in room temperature for at least 30 minutes. 2. Season with salt and pepper (and herbs, if desired) right before you cook it. Don't season it earlier because the steak may turn out too salty and dry. 3. Coat the pan/griller with a little amount of olive oil and cook. Personally, I love the grillmarks on the steak when cooked on a griller. 4. The secret to a good steak is the juice, so how long you cook it is the key. We love our steaks done medium-well, so we pan-fried it our 3/4 inch-thick steaks at around 2 minutes per side. If you want it well done, you may need a bit more time and less time if you want it rare or medium done. 5. When the steak is done, plate it and allow some time before serving it. This is to give time for the juices to settle. Because we haven't bought any steak sauce, we improvised and made our own. And as an added plus, it's so easy to make, with ingredients just readily available in the kitchen. There's no need to buy steak sauce anymore! 1. In a small bowl, mix one part each of worcestershire sauce, soy sauce and ketchup. I love this sauce, it complements the steak very much! I have read that the magic formula for the perfect vinaigrette is 3:1 portions of oil to vinegar. I did a little variation with my measurements but it'd turn out okay. 1. Whisk the olive oil and balsamic vinegar on a mixing bowl. When they are temporarily mixed, drizzle it on the lettuce greens and serve.